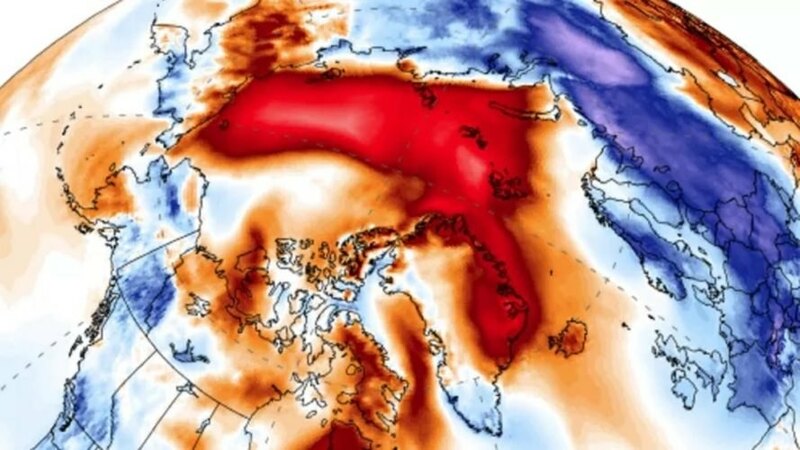 A recent bout of extreme warm weather in the far north Arctic Circle is setting new temperature records and unnerving climate scientists. “To have zero degrees [Celsius] at the North Pole in February – it’s just wrong,” researcher Amelie Meyer told the Sydney Morning Herald. “It’s quite worrying.” Cape Morris Jessup in Greenland, the most northern land-based weather station, has already experienced 61 hours above freezing this year, an all-time record. The previous record was set in 2011 at only 16 hours above freezing by the end of April that year. The world’s weather seems to literally be upside down. Climate scientist Andrew King told the Sydney Morning Herald “Parts of Greenland are quite a bit warmer than most of Europe”. In addition to, and likely connected to, climate change, the so-called polar vortex that has kept frigid polar air contained in the Arctic has weakened in recent decades. As a result, warm air more frequently settles in the far North even during winter while extremely cold air has dipped deep into North America and Eurasia, bringing temperatures in normally warm regions to record lows. As north Greenland experiences its relatively balmy weather, continental Europe endures a deep freeze, with temperatures in Berlin dropping as low as minus 12 degrees Celsius. The abnormal weather is even changing the orientation of weather systems. “For Britain and Ireland, most weather systems would typically blow in from the west, but [on Tuesday] we will see a cold front cross Britain from the east,” said Dr. King. In light of the extreme weather, the ice coverage in the Bering Sea is now at levels usually seen in May or June. The long-term effect of shrinking ice coverage acts as a positive feedback loop. Sunlight is reflected off of ice back into space, protecting the frozen seas. When the ice is gone, this heat is absorbed by the water, which then warms ice that remains. The situation is grim; while scientists had originally predicted an ice-free Arctic by 2050, these recent warm spells calls this prediction into question. Record warm winter temperatures in the North Pole are causing the sea ice to melt faster than usual. A temperature map shows the mass of warm air gathering in the Arctic Circle.